Hyderabadi Recipes,40 Hyderabadi Dishes, Hyderabadi Food. We have a large collection of different types of Hyderabadi dishes. Yes, it's clrealy evident that Hyderabadi recipes and the different types of Hyderabadi dishes are super popular not only in South India but all across our lovely country. Hyderabadi cuisine is known for its tradition and richness. Even every day food is rich in flavour, with special masala pastes, while delicacies are even richer with abundant use of dry fruits and dairy products. We often find ingredients like cashew paste and fresh cream being used in gravies. Likewise, dry fruits and nuts are also used extensively, not only in desserts and sweets but also in savoury Hyderabadi dishes like koftas, pulaos, subzis and snacks. This is due to the long period of Mughal rule in that region and the indestructible mark they have left on the culture and cuisine of the city. Veg Biryani have become synonymous with the Hyderabadi cuisine of that region. Biryani is a very richly flavoured rice preparation in which the rice is cooked with flavour-packed gravies, whole spices, veggies and other ingredients. The sequence in which the ingredients are added to the Biryani and the way the rice is cooked are all significant steps that make a Biryani perfect! Nowadays, it is easy to make Biryani using a pressure cooker or microwave oven, but the traditional method of cooking them in earthenware or closed handis gave them a special flavour and irresistible aroma. Hyderabadi Khatti Dal is made daily in Hyderabad and a favourite of the region. Also the protein rich Spicy mixed dal is a must try. Mirchi ka Salan Hyderabadi style is a curry of Bhavnagari chillies, flavoured with a rich paste of roasted peanuts, coconut, sesame seeds and red chillies and is a great side dish for Biryani. Hyderabadi Veg Korma goes will with some hot naan. Which paratha is the most popular Hyderabadi dish? Our vote goes to Bidari Paratha and it goes really well with the famous Burhani Hyderabadi Raitas. A festive sweet from the rich Hyderabadi repertoire, the Double ka Meetha made with a unique mix of ingredients like bread, mava and almonds. We have Gil E Firdaus and lot more Hyderabadi sweet recipes. 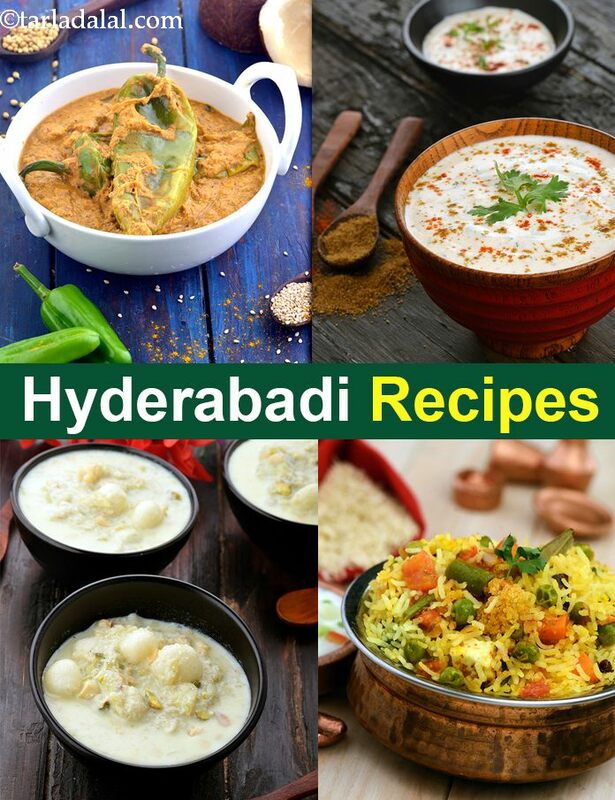 Enjoy our vast collection of Hyderabadi recipes. My favourites are Qabooli Biryani, Hyderabadi Veg Haleem and Tamatar Ka Kut. Enjoy our Hyderabadi Dishes and Hyderabadi Recipes articles below.